So many awesome cover reveals lately, and all for books I’m excited for! The third Ghost and the Goth novel, I can’t wait to see how this series ends. I’ll miss Alona and Will. 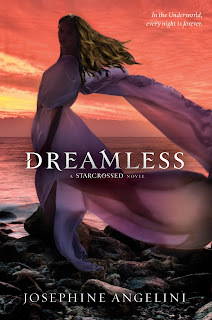 I’m also very excited for Dreamless. I loved Starcrossed and can’t wait to see what happens to Helen. There’s no summary yet for Dreamless, so for those who have not read Starcrossed yet, here’s the summary for the first book. Love both these covers! Body and Soul really fits the rest of the series, it’s probably my favourite out of all three! And I like Dreamless too – can’t wait to see the UK version as well. Thanks for sharing!